Few of us at Dieselbikes decided to take a trip to the US Nationals held out at Mount Snow in Vermont. This was the first year we attended this event as a spectator after hearing a number of rave reviews regarding this annual event. We decided to attend only one day of this multi-day event with the goal to shoot as much film for our up coming mountain bike movie. The level of talent showcased at this event was amazing. From downhill, XC and dual slalom racing to observed trails, this event had something for every mountain biker. The National Observed Trails competition was an unparallel display of balance and control of a bicycle. The field was small with only 4 riders, but the challenges set forth by the 6 demanding courses were intense. Each course was layout within a relatively small area allowing spectators to view just about every second of the action. Utilizing many natural and non-natural features, each course became progressively difficult to negotiate. 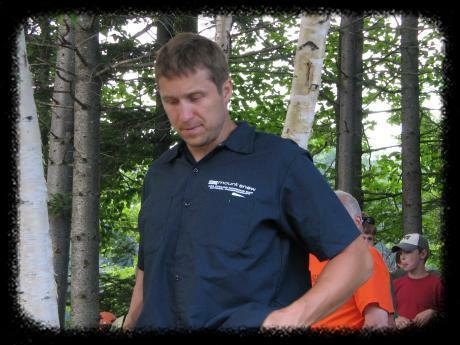 The judge for this event was none other then pro trials rider Jeff Lenosky. Jeff kept a watch full eye on the competitors as they navigated their way through each course within the 2-minute time limit. Every rider’s performance was like watching a ballerina defying physics as they hopped and jumped through obstacles that most people would have a hard time walking. If you have never been to a trials competition, we would recommend attending one just to see what can be accomplished on a bicycle. We took a break from the trails comp moving our way over to the expert and pro cross-country course. This course was naturally difficult with two large hill climbs and fast loose gravel downhill sections separated with a number of twist and turns. Watching many riders burn their legs during the hill climb sections made us appreciate that we prefer life service downhilling. Club member Nathanial Williams was in attendance the day before our visit racing in the 15-16 Sport XC class finishing 5th. Nathanial has been racing for a number of years and is currently sponsored by Maxxis Tire and Bikeman.com leaving this 15-year-old kid with tons of opportunity in the near future. 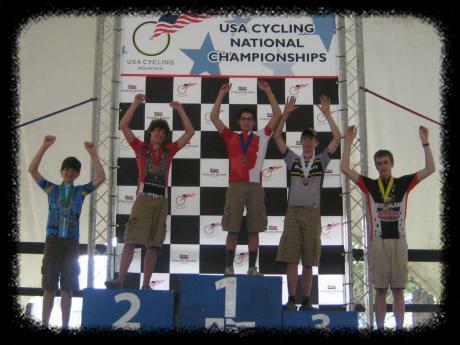 Its great to see a local rider rip it up in a National's race…great job Nate; our hats off to you! It was getting close for the National's expert class downhill races to begin, so we trekked our way up the mountain race course to watch the action first hand. Apparently this year, the expert/pro course was not routed through the notorious yard sale section that draws a number of spectators to watch the havoc unfold. This year the race course was routed through a number of different sections then previous years. We heard from a number of riders the course this year was rather easy from a technical perspective, however much faster with a gradually decent. In either case, the course had its share of technical sections and bicycle carnage. During the race, we worked our way down the course filming different riders negotiating sections of trail. The riders were fast, wiping past trees and through rock gardens, however every so often we would see a rider pedaling with a flat tire. It is typical to see one or two racers with flats, but during this race, we counted over 12 riders trying to make their way down the course with flat tires. Many spectators were calling this the flat tire race since the overall time and ranking for many riders were hampered by this handicap. There were more local riders present representing the Boston Area. 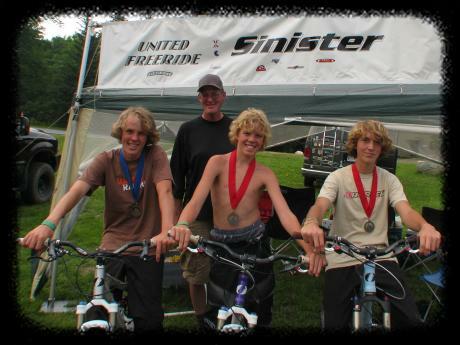 Max Syron, Ryan Syron and Danny Mears all members of the United Freeride Team sponsored by Sinister Bikes were present ripping up the downhill course. Max Syron took home Gold in the Junior Sport class, Danny Mears took home Silver in the Junior Beginner class and Ray Syron followed up with Silver in the Junior Open. Just as Nathanial, we are proud to know these young riders and happy to see more local kids getting into racing. Keep an eye on all these guys, who knows, they just may be the next big New England stars! Last on the list was the semi-pro/pro Dual Slalom race. This by far was the most energetic event we witnessed. Two hours of fast pace head to head racing that had its share of intense moments. If you have never been to a Dual Slalom race, you need to witness one. The crowd participation during these races was huge. You felt the energy and tension of each race, as the two riders would pedal down this short course bidding to cross the finish line first! Each round became more intense as one competitor would eliminate the other boiling it down to just two finalists for gold. This again is another event that takes place in a relative small area allowing the spectator to witness just about every second of the action. Even though is was just one day, our trip to the Nationals was an experience we will not forget. With a number of different spectator events, expo area and energy in the crowd, we are certain to make the return trip next year. If you were not able to attend the Nationals, don’t worry, we shot a ton of film and will pick the highlights of this event to feature in our upcoming 2008 mountain bike video for your viewing enjoyment. Visit this page form time to time as we will post pictures and short video clips below. to all who attended this ride and big thanks to Ethan for keeping it real!